I was, and I was suddenly embarrassed that I had even brought it up. 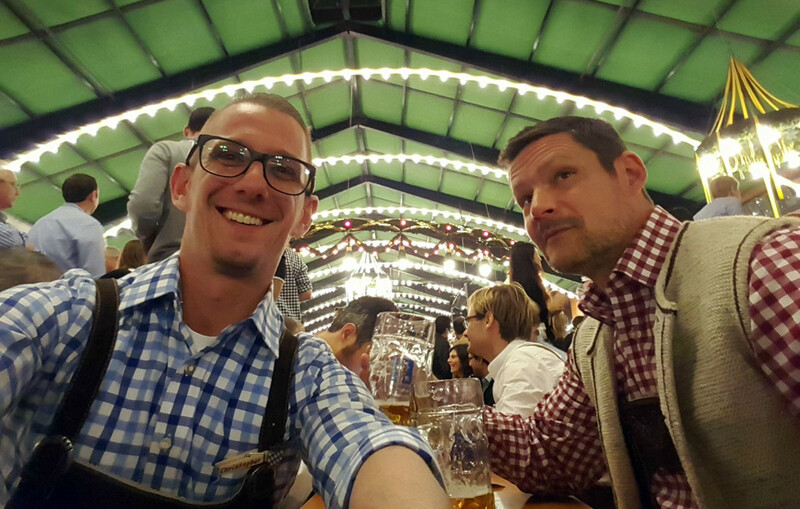 It was Friday night at my first Oktoberfest. Surrounded by native Bavarians, I was full of questions about the festival and life in Munich. And I was wearing Lederhosen for the first time. Though they ended at the knee, they were surprisingly warm. The suspender straps that seemed too short at the beginning of the day had relaxed enough that the whole outfit felt comfortable. For the uninitiated, a set of Lederhosen (literally “leather breeches”) consists of leather shorts or knee length pants with leather suspenders that attach with buttons. There is also a flap on the front. Presumably it allows for fast access to offload liters of beer from your system. Standing in line for the urinal, I fumbled to undo the sturdy wood buttons on my flap. It suddenly dawned on me that I also needed a game plan for lowering my underwear inside the lederhosen to be able to take care of business when it was my turn. Then it occurred to me that maybe I wasn’t supposed to have worn underwear at all? Maybe lederhosen are meant to be worn like kilts? Of course, I asked immediately upon returning to my table. My host’s response, this post’s opening sentence, was delivered with a mix of shock and amusement. Even with the vast resources of google at my fingertips today, I am still not sure of the correct answer. Is Oktoberfest just a giant beer festival? The first Oktoberfest commemorated the wedding of soon-to-be King Ludwig in 1810, and has grown into a massive public fair that celebrates Bavarian heritage. This includes the food, the costumes and the traditions. While it is not just about the beer, beer is deeply ingrained in German culture. 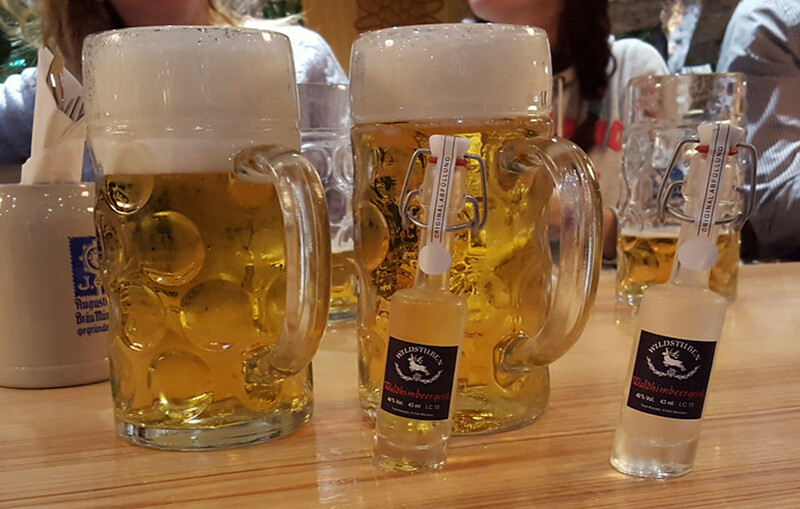 The only beer that can be served at Oktoberfest must be brewed inside Munich city limits. It must also be brewed to the stringent standards of the Germany Beer Purity Law. You will only find beer from these 6 breweries there: Augustiner, Hacker-Pschorr, Löwenbräu, Paulaner, Spatenbräu and Hofbräu. Is there more to do there than just drink? Half of the festival is a long run of beer halls large and small. The other half is an equally long midway with rides, food, games and shopping stalls. Each half is massive. Think of it like a state fair or a small amusement park. 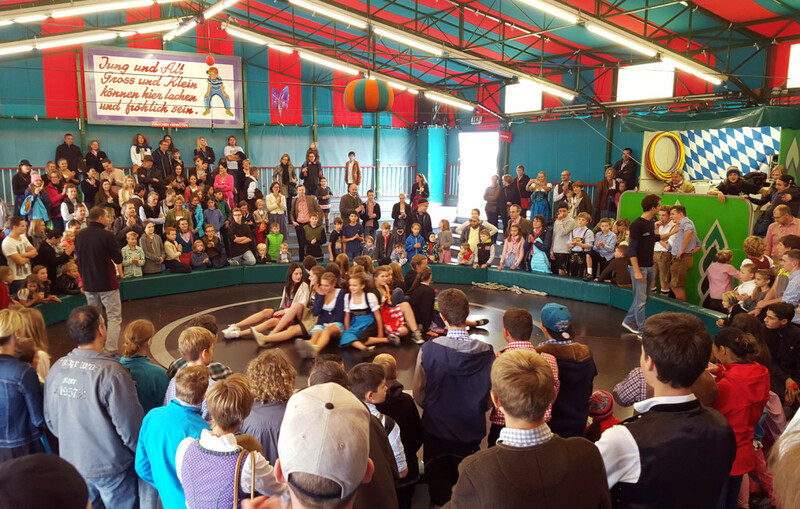 It is a very family friendly affair, with plenty of amusements, attractions, shows, and culture for all ages and personality types. Is everyone there wearing lederhosen? The number of people I saw wearing trachten (traditional German/Austrian clothing) exceeded the number of people who were not, but it’s not required by any means. Real lederhosen or dirndl are finely crafted, heirloom quality garments with specific symbolism and history. Their cost can quickly run into four digits. 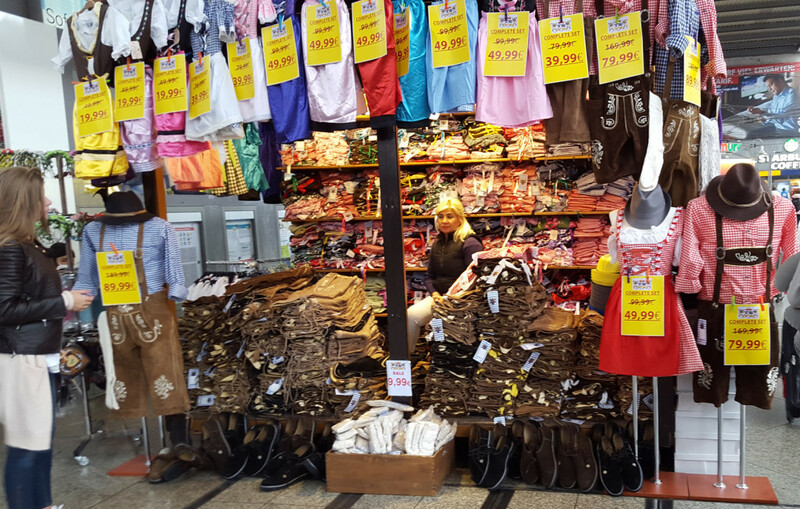 So that no one feels left out, there are popup shops all over the city selling costume-like outfits that look the part for as little as 20 to 200 Euro ($20-$220) a set. How much does it cost to go to Oktoberfest? Admission to the festival is free. Just bring plenty of cash for food, beer, souvenirs and rides. Is it just one huge room with a bunch of people on benches clinking beer steins and singing along to oompa bands? That scene plays out constantly inside each of the 13 large beer tents (and many of the smaller ones). It is exactly as fun and lively as it looks. I keep reading that I need reservations to sit in a beer tent. Is that true? In a word, no. We spent four days at the festival (Thursday through Sunday) and got seats every time we set out to. Almost every tent has a section of seats set aside for those without reservations. These tend to fill up quickly, and the lines can be long and are not always orderly, particularly in the evening and on weekends. Trying to find seats without reservations added to the sense of adventure, and also left us free to explore at our own pace without feeling like we had somewhere to be at any certain time. If you are patient, outgoing and not particularly picky, you will be able to find some place to sit. You’ll also meet a lot of really interesting people from all over the planet. What if I want reservations? Reservations are difficult but not impossible to come by if you start early enough. Each tent issues their own and they are often gone months before the festival. Most tents start accepting reservations in January, February or March for the coming year. The website for the City of Munich has a great guide if you want to go that route. 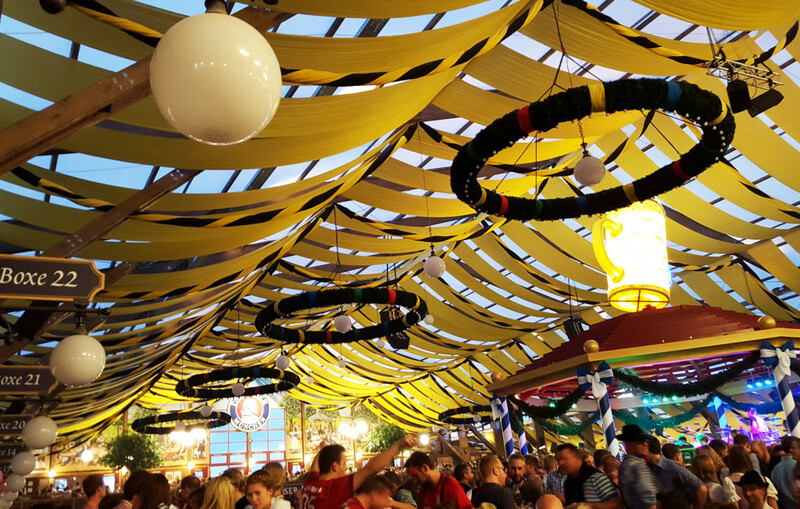 If it’s the last minute or your time in Munich is limited but your money is not, and you really want to have the beer-hoisting, singalong experience with a few thousand new friends, then you could consider paying for reservations. In most cases reselling them is forbidden, but many tour operators offer them as part of a pricey tour. Similar to hard-to-get concert tickets, the prices for the reservations in one of the main beer tents can be steep in the aftermarket. Though we opted to try our luck without them, we found plenty of reservations for sale right up until the last minute both online and through the concierge at our hotel. Do I have to be in a tent to drink? To drink out of the iconic one liter glass steins (called a Maß), you need to be seated at a table at one of the beer tents. For those who want to drink without all the anxiety of standing in line, hunting for seats, or securing expensive reservations, there are plenty of alternatives. The outdoor beer gardens at each large tent are usually fairly easy to get seats in, and they serve the same food and beer as the tent they are connected to. There are a few small standalone beer gardens throughout the festival. There is also no shortage of stands where you can have schnapps, champagne, or just about any mixed drink you can name. Lastly and worth noting is that there are many smaller tents that look and feel like cozy German restaurants inside. They offer all the same food, drink and fun as the large beer tents, without the massive numbers of people. Is it a free for all for unreserved seats? Come as early as possible. On weekends, lines will form outside the tent before it is even open. If you miss that window, getting a seat is a tricky combination of first-come-first-served and the discretion of whoever is sitting at the table already. You can roam around inside the tent until you spot an opening. Turn on the charm and ask whoever is seated near the empty seats if they are available. The most important thing to remember is not to be rude or pushy. Getting frustrated or arguing will only ruin your own day, so just politely accept their answer and move on. I found that just holding up a thumb and a finger, and saying “Zwei, bitte?” (“Two please?”) always got a quick nod yes or no. The advantage to this is that it pretty quickly establishes that you don’t know much German, so it’s likely to land you next to someone who is okay with that. Can I walk through the beer tents without drinking or sitting down? Each of the tents has different decor, different ambiance, and different clientele. Just walking through them to take in the atmosphere is a cool experience in itself. You can generally enter and walk the perimeter inside most of the tents to gaze at the spectacle. The aisles are crowded and active so lingering or standing around will not always be possible. If tents are for reservation holders only, security will stop you at the door asking to see your wristband. Signs will also be posted or the entrances will be roped off if the tent is at maximum capacity. What’s the restroom situation like? Each tent has restrooms inside and the lines move relatively quickly. There are also plenty of facilities scattered around the festival grounds. My advice here is to locate them before you need them. A few are tucked away behind rides or tents, and these hidden gems are far less crowded. The lines are longer for those needing a toilet than for those needing a urinal (sorry, ladies!). For the latter I never had to wait more than a few seconds. Is it just a bunch of rowdy drunks causing a ruckus? There were a few people sleeping off their beer on sidewalks or hills around the festival. Some had a tough time walking in a straight line. For the most part though, I was amazed at how well everyone seemed to hold their liquor. Security at the beer tents is visible but not intimidating. Given the massive attendance numbers, it felt surprisingly clean, safe and orderly everywhere in and around the festival. Do I have to stay in a hotel close to the festival? Public transportation in Germany is excellent, and there is a subway stop literally at the entrance to the festival grounds. Since the festival mostly shuts down around 10:30 every night, you do not need to worry about it being too late to travel by train. Taxis and pedicabs were also abundant at all hours. If you prefer to stay close to the action, there are many hotels near Munich’s central train station. It’s just a five block walk from the festival grounds. Everything inside the festival is cash only. Inside the tents, you pay on delivery for beer or food, likewise with food or drinks at any stand you walk up to. 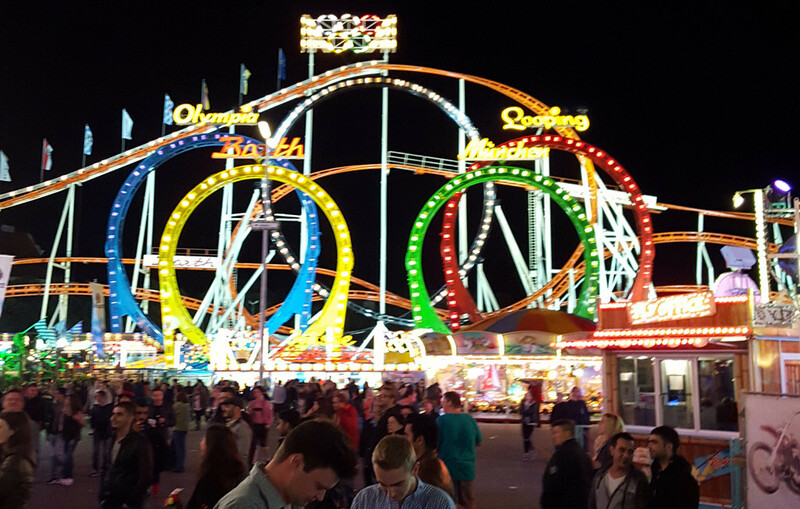 Rides or amusement attractions each have a posted price at their entrance, so you pay as you go. If you are seated in one of the smaller tents, the check may come at the end of your meal, similar to being in a restaurant. How much time should I set aside to see Oktoberfest? This depends a lot on what you want to do and how adventurous you are. We overheard people in a tour group mention that the few hours they spent there one evening was more than enough. We spent an average of about five hours a day there over four days. If you like beer and camaraderie, you can easily pass three or four hours at a time seated in a beer hall. 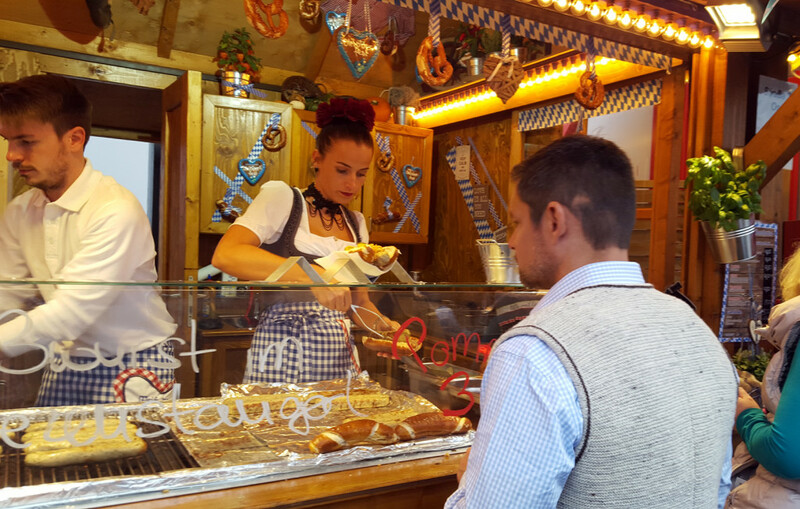 If you like German food or are an adventurous eater, tack on a few hours to roam and sample the wares at different stalls. And there is no limit to the amount of time you can spend just people-watching, riding the many rides (including 2 full size roller coasters), or enjoying the shows, games and attractions on the midway.